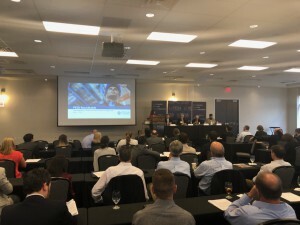 The PESA Supply Chain Committee holds quarterly roundtable events educating PESA Member Companies on the various trends, challenges and solutions affecting domestic and global supply chain departments. The most recent roundtable — Trade Regulations, Tariffs, and the Potential Effects on Supply Chain — was held on May 11 and jointly hosted by the PESA International Trade Policy Committee. Panelists included Jim Owsley, Vice President, Supply Chain, DistributionNOW; Kartapurkh Khalsa, Senior Counsel and Director of Customs Compliance, NOV; and PESA Advisory Board Member Doug Polk, Vice President, Industry Affairs, Vallourec. Brad Wise, VP Marketing, DistributionNOW, moderated. This past March the Trump Administration imposed a 25% tariff for imported steel and 10% tariff on aluminum under Section 232 of the Trade Expansion Act of 1962. PESA has actively engaged in this topic and the two Committees developed the roundtable to address this very critical issue. Top open the event, Doug Polk sharing insights on seamless steel imports as an integral part of the U.S. market, illustrating with regional import data. Polk shared that between 2015-2017, the U.S. imported a high percentage of steel from numerous countries around the globe, noting the high dollar volume coming from the EU. Jim Owsley then segued into an overview of the effect Section 232 has had in the United States and the global price increases of such steel substances as hot roll coil. Owsley shared what is covered by the investigations, the 2017-2018 timeline and current questions that remain for Section 232. Owsley also discussed Section 301, an investigative mechanism being used to determine whether China’s acts, policies, and practices related to technology transfer, intellectual property, and innovation are unreasonable, unjustifiable, or discriminatory and burden or restrict U.S. commerce. Kartapurkh Khalsa touched upon Section 232 as well, sharing the Request for Exclusion from Remedies: Section 232 National Security Investigation of Steel Imports document with the attendees. He provided a comprehensive overview of the form, explaining sections that have proven to be difficult and ambiguous for companies. PESA’s International Trade Policy Committee has led PESA’s recent actions regarding the Trump Administration’s proposed tariffs under Section 232 of the Trade Expansion Act of 1962. PESA also continues to engage with the Alliance for Competitive Steel and Aluminum Tariffs (ASCAT), which represents steel and aluminum downstream users and U.S. exporters.